This was often a significant burden to the customer. Additionally, if they could not replicate the issue or had limited technical abilities, this process became increasingly more difficult. Talkdesk is the world's leading browser-based call center software.The easy-to-use out-of-the-box call center software solution helps growing businesses improve customer satisfaction, while simultaneously reducing customer support costs. Usersnap helps our support team gain visual insight into technical issues within our application, troubleshoot with our customers and provide a timely resolution to their issue. Our development team also uses it to quickly identify bugs and remediate any issues. It has been a standout tool in both our support and development teams’ toolbelt and has been instrumental in helping us increase customer satisfaction and customer loyalty. With Usersnap, our customers send us relevant information with a click of a button, making this process more effective and streamlined for both parties. We populate this data into Zendesk automatically to help increase collaboration between our customer support and development teams. 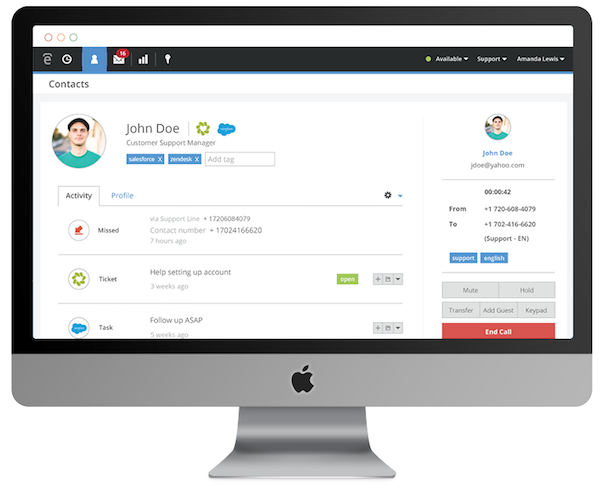 We also integrate Zendesk with our own call center software solution, so when a customer calls, Talkdesk provides all of their information to our support agent in real-time. Taken together, integrating Usersnap, Zendesk and Talkdesk has significantly helped to increase customer satisfaction, streamline workflow and allow our team to deliver top-notch support!